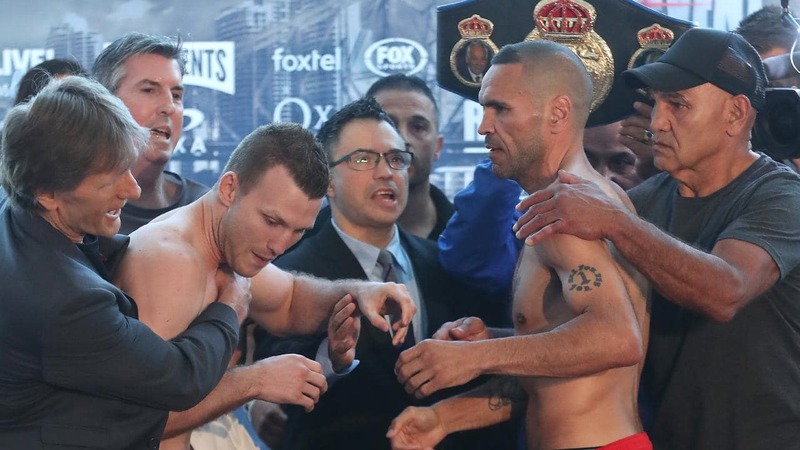 Anthony Mundine scuffles with Jeff Horn at the weigh-in ahead of their 71kg catchweight bout. Photo credit: News Corp Australia. Anthony Mundine 48-8 (28) has lashed out at Jeff Horn 18-1-1 (12) grabbing him by the throat and pushing him backwards at the weigh-in for their 156.5-pound catchweight bout at Suncorp Stadium in Brisbane, Australia on Friday night. The 43-year-old veteran’s fiery response came as the pair engaged in in a shirtless face-off for the cameras with both protagonists throwing verbal jabs at the other after they both came in comfortably below the contracted weight. Mundine still faces severe financial penalties if he puts on too much weight and exceeds 165.35-pounds two hours before tomorrow night’s grudge match, but says he has no concerns about coming in heavy in 30 hours’ time. “I eat like a rabbit anyway,” he said. Horn laughed off the altercation and said it was a clear sign that Mundine was frustrated at having to cut weight. “He must be struggling to make weight with the push there,” said the 30-year-old former WBO welterweight champion, who weighed in heavier than his opponent at 155.5-pounds. The fight will be Horn’s second at Suncorp Stadium, where he upset the oddsmakers in July last year when the then little-known Australian outhustled and outmuscled Filipino boxing legend Manny Pacquiao over 12 hard-fought, physical rounds. This fight will be Mundine’s third appearance at the venue but his first as a boxer. In his former career as a professional rugby league player he represented New South Wales twice Suncorp Stadium – then known as Lang Park – for a loss and a draw. Win, lose or draw, Mundine is widely tipped to announce his retirement in the wake of the fight.